After the ending of Empire of Storms, we knew KOA would be emotional, would be epic, and hoped it wouldn’t be too heartbreaking. Well, I was an emotional mess, not just because heartbreaking things happened, but also because of the hope and strength, of mind and body, that was displayed by the characters I have grown to love so dearly. This is the end for new content about one of my favorite groups of characters (as far as we know). Six years and eight books later, and we’re saying goodbye. Sarah J. Maas is a genius at weaving stories together and making you feel so wrapped up in the world she creates. I don’t think I’ve ever cried, shrieked, panicked, and swooned more than while reading an SJM masterpiece (ACOMAF and Queen of Shadows being my faves). If someone only read Throne of Glass and Kingdom of Ash, they would say it was a completely different series. 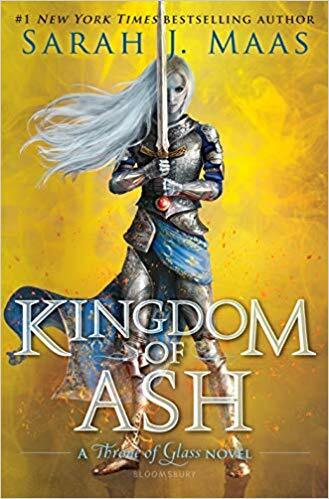 Celaena to Aelin, Prince Dorian to King of Adarlan, a completely new court, and Celaena’s fight for personal freedom from Endovier turned into an epic, world-changing war about Valg demons. What?! This is one of the only series I know that covers so much ground and takes on so much of a story. And yet, Aelin and Sarah J. Maas never forgot the beginning, or the people along the way. Aside from specific scenes, my favorite part about KOA was that SJM was so meticulous in remembering to tie up even the most minute of storylines, even the storylines that we readers didn’t remember or think of as storylines. Maas never forgot all the tiny threads she had been intricately weaving throughout her series (okay there was just one tiny one that bothered me, but I’ll get to that in the Spoiler-full section). Seeing all of the pieces that Maas pulled together to create this final tapestry, this final Throne of Glass masterpiece, it makes you realize how invested she was in the story, in the characters, and how detailed she was in making sure this series was the best it could be. Gosh, there were SO MANY amazing moments in this series. Big moments, tiny moments, parts that made me cry, parts that made me not want to keep reading so I could stop heartbreaking things from happening. I think my favorite moment of the series was Manon accepting her Crochan crown. Manon’s character arc is one of my favorites. From a heartless witch to finding hope to accepting her Crochan heritage and fighting for her friend. When she and the Thirteen (omg) landed on Aedion’s battlefield and said we are here for our friend, Aelin, I WEPT. I couldn’t even see the pages. Manon came so far from the character we were introduced to, and her showing up and rallying witches to support the friends she had made was so incredibly moving. I would have loved to see Manon land in the wastes, but I'm satisfied knowing she finally took her people home. Fenrys and Aelin’s friendship and their secret language was also one of my favorite parts. One of my (few) big issues with these books is that everyone magically finds their perfect pair. Rowan and Aelin, Yrene and Chaol, Manon and Dorian, Elide and Lorcan, Aedion and Lysandra. Seriously, why? Out of everything, Valg demons and all, I find everyone pairing up to be the most unbelievable and annoying (Even though I know I’m really supposed to be mated with Dorian, but whatever). Anyway, because of this, Aelin and Fenrys’ friendship was even more special for me. I can’t list everything I loved or was sad about, because my review would be as long as KOA. But here are a few things I can’t stop thinking about: Page 800, Feyre and Rhys omg, I loved it. The Thirteen sacrificing themselves and breaking the curse, I can’t believe it. Evangeline and Darrow. Gavriel. Aelin remembering Sam Cortland moving the canons at Skull’s Bay. Dorian and Kaltain. Yrene and Elide’s friendship. The way Manon and Dorian left their relationship. The role Endovier played in this book. The themes of going/coming home finally. The goodbye scene between the original three (they were the catalysts that started the TOG ball rolling, Rowan knew to give them space, and none of them forgot where it all started). The tiny thread I wanted to see wrapped up was Aelin’s dance teacher bringing music to a free Terrasen. The Heir of Fire musicians’ sacrifice scene is one of my favorites in the series, and I would have loved for the hope of music to be brought to Terrasen. But I know there’s time and hope for that in their future. That there's hope for a better world. When I first heard about Illuminae, the first book in the Illuminae Files series, I was skeptical about the unique formatting. While I can’t say too much about the plot without spoiling the first two books, the series is set in space in the year 2575, beginning with the hostile attack of an ice planet called Kerenza by a corporation called BeiTech. The survivors escape to two spaceships, but their problems are far from over as the corporation attempts to cover their tracks by killing the witnesses. Told through dossier-style documents, the story follows the attempts to survive spaceship attacks, limited supplies, diseases, and hidden information. Sure, it sounded like an interesting story, but would it be hard to follow? The answer is no. 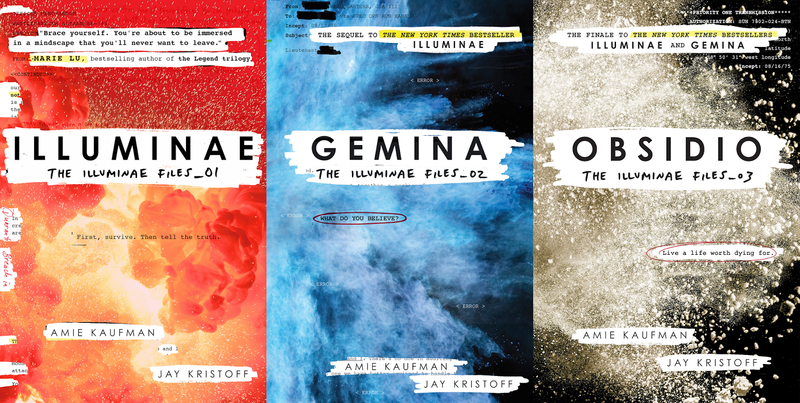 I devoured Illuminae in one day, and I’m so glad I gave this series a chance. I was going to say that the book was amazing despite the format, but that would be wrong. Illuminae, and its sequel Gemina, were so amazing because of the immersive dossier style of the books, as well as the cast of characters. The myriad of document types, such as IM chats, emails, video footage reports, and more all added to the exciting tale. 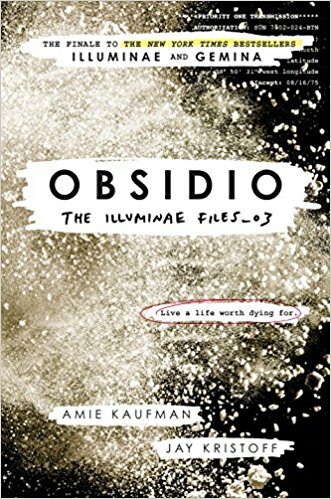 After the first two books, I was hooked and couldn’t wait for the third and final installment, Obsidio. But I made it! And it was well worth the wait. I was so excited that Obsidio brought together my beloved characters from books one and two. 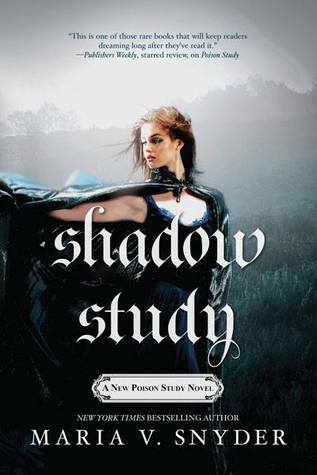 The third installment was the perfect mix of characters I have loved from the first book (though I can’t say who, because the survivor list is spoilery) and new characters that added a great new vantage point to the story. The three stories come together in a mind-boggling way- how did Kaufman and Kristoff manage to work all of these pieces together in such a satisfying, heartbreaking, meaningful story?? The culmination of this series is not only a brilliant masterpiece of fiction, but is also a tale of humanity, loss, and the grey area between good and evil, right and wrong. Obsidio really made me think and, although it is a romantic story, the focus is survival and finding the truth in a censored world. I can’t recommend this series enough. The other day my best friend and I were discussing how ridiculous it is that we love reading so much that we decided to be English majors, but now that we are actually majoring in English in college, we have no time for recreational reading. Does this make any sense at all? Not to me. I see all sorts of books that I would love to read, but I just have no time! Between attempting to understand Shakespeare for one class, writing 12 page papers about Reader Response Theory in another, writing 25 page persuasive research papers for another, and reading Samuel Shem's House of God for a fourth class, it seems like my days of reading for fun have been left behind in high school. Wow, Red Queen. First of all, I try not to buy books at their full price, because, even though I like to support the author, I can't frivolously spend between $18 and $25 for a new hardcover book. 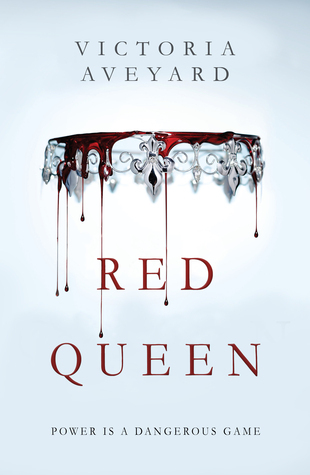 That being said, I had seen previews for Red Queen and I was so excited to read it, so I treated myself to it (on Valentine's Day…Happy Valentine's Day to me). In between classes, studying, and reading for school, I snuck in time to read to Red Queen and I was not disappointed. If you like Hunger Games, Divergent, and other dystopian novels, read this one. 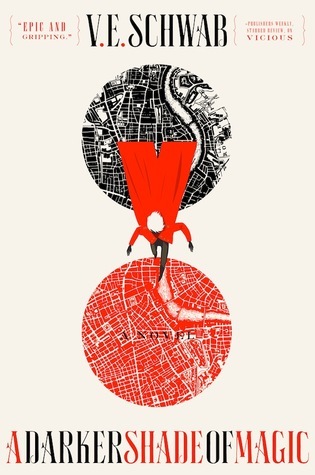 Although I had seen from other reviews that the premise is similar to Red Rising by Pierce Brown (now on my to-be-read list) and although I have read quite a few dystopian young adult books, I was still blown away by the originality. While I will admit that the original plot points are mixed in with parts that are not so original- such as people having powers, forcing people to watch violence in order to keep them from rebelling, and other themes- I found the plot original enough to be shocked and enthralled. The author, Victoria Aveyard, is also a screenwriter, and I could visualize the story as a movie the entire time. I am sure that it will be a movie soon enough, joining Divergent, the Hunger Games, and Harry Potter on the big screen. As readers, we have grown used to the "Love Triangle" of the guy she should be with, the guy everyone wants her to be with, and the guy she wants to be with (two of these labels being attached to one of the two boys in the triangle). However, is Red Queen it was like a Love Rectangle and I couldn't keep track of my emotions. One minute I loved Cal, the perfect prince and future King. The next minute I adored his younger brother, Prince Maven, the shadow behind his "perfect" brother. And then I would find myself drawn back to Kilorn, the Gale to Katniss, the Mare had known forever and secretly saw herself growing old with. I won't spoil the book for anyone, but CRAZIEST PLOT TWIST EVER. I thought the ending would be predictable- the typical good guy wins over bad with the love of their life. Boy, was I wrong. The plot twist was so shocking, I'm still shocked. It was almost a "Jace is Clary's brother" revelation and I couldn't help myself from gasping (thankfully not loud enough to wake my roommate). I thought I would explode and then I thought it must be a joke, a trick, that it was all just a misunderstanding. Obviously, I can't wait for the second book to see what happens next. Sadly, it only came out last week, so I have a long time to wait. This book was not only a fantastic read that kept me on my feet, but it by seeing how young the author is, I was shocked into thinking that maybe I could be a writer. I definitely recommend reading it! But seeing that it has already reached #1 on the Young Adult New York Times bestsellers list, I have a feeling that people don't need me to tell them to buy it. As an English major, I have often found myself thinking "I really should have read that book already"…with a twinge of guilt. This happens especially when I stroll awkwardly past the Classics display in the bookstore, trying to ignore the glares I feel from the Charles Dickens and Shakespeare covers on my way to the bright and shiny Young Adult section. So, in an attempt to dissipate my guilt and become more "worldly" I suppose, I am going to make it my mission to read more of these books. About a year ago, Amazon released a list of the "100 Books To Read In A Lifetime". Amazon's editors voted and chiseled down the list to just 100 books, ranging from Where the Wild Things Are to 1984 to Pride and Prejudice. I was pretty pleased with myself because I have read 20 off the top hundred, but I want to make it my mission to read all of them. I have listed the books under a "100 Books To Read" tab and cross them off as I go. I also wanted read the list of books Rory Gilmore read in the TV show Gilmore Girls, but I don't think I can read all 339 of them any time soon. I got If I Stay as a Christmas present from my best friend, without having seen the movie. I trust her taste completely, so I decided to read it wrapped in a blanket by the fire on a cold January day….annnd finished it the next cold January day, by the same fire and under the same blanket. 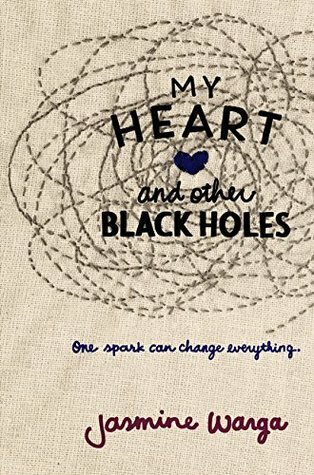 Mia's family was not the normal family, with a dad who was a rocker-turned-teacher and a mum who was a groupie-turned-mother, but her connection to them and love for them reminded me of my own. Although there were things that did not allow me to connect with the story as well as I would have liked, I was taken aback by how in detail and real it felt, for a story about a ghostly figure. 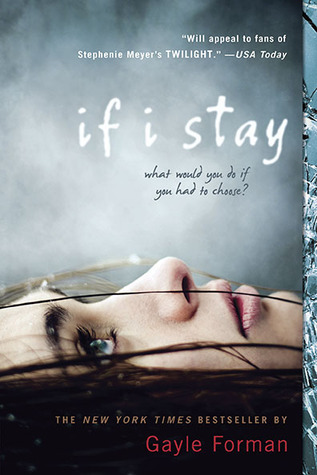 Mia is in a car accident that kills her mother, father, and brother, and leaves her as an outsider of her own body. She tells the story from her perspective during an out-of-body experience, as she watches doctors and her loved ones attempt to keep her alive. 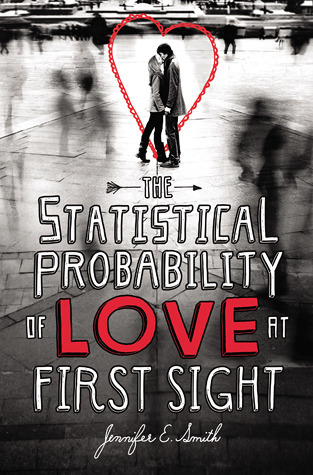 Although it was supposed to be mainly focused around her romance with her boyfriend, I felt that I was more intrigued by the rest of the book and the questions that it raised for me: how would I react if this happened to me, does this really happen to people, do people who are injured actually have an influence in whether or not they keep living? The most important part for me was the effect Mia's accident had on other people. Just like John Green's The Fault in Our Stars, Mia's grenade went off and the people around her were affected. But that doesn't mean that just in case we might lost someone, we should block ourselves off from love and friendship. My favorite part of the book was the feeling that it left me with, knowing that although Mia had lost her immediate family, she still had a family of a mixture of blood relatives and people she had collected along the way through friendships. I am excited to share that I now have my own domain, under a new name. 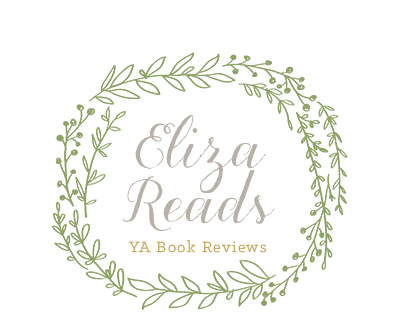 Although the content and look of my blog will remain the same, I have changed the name of the site to Eliza Reads! The new domain is elizareads.com, which is a lot easier to remember than ramblingsofeliza.blogspot.com… too long. Anyway, if you type in either you will still end up at the same place, but I think the new URL is a lot more snappy!